Obama’s foreign policy debate: From Bin Laden to Libya to drones, he’s the candidate of vengeance. Obama isn’t the candidate of war. He’s the candidate of vengeance. 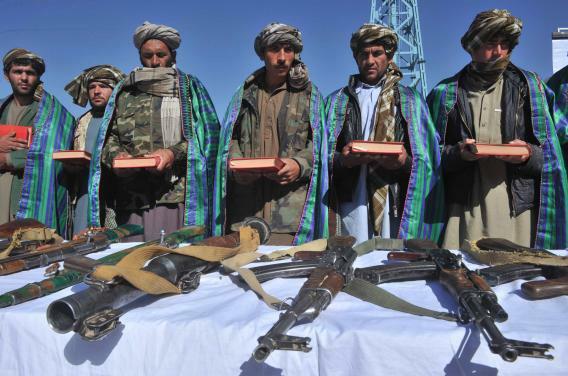 Former Taliban fighters display their weapons after they joined Afghan government forces during a ceremony in Herat on Monday. Photo by Arif Karimi/AFP/Getty Images. There’s a flip side to that irony. Barack Obama, the liberal law professor, has become the lord of drones, raids, ousters, and assassinations. He hates troop deployments but loves to purge, punish, and liquidate. He’s not the candidate of war. He’s the candidate of vengeance. I’m not saying the candidates have totally switched postures. Romney is still trying to out-macho Obama on military spending, standing up to Russia, and apologizing for America’s sins. Obama is still calling Romney “reckless” and complaining that the former governor would leave too many troops in Iraq and Afghanistan. But Obama’s complaint is about leaving our soldiers overseas after we’ve done the job. Obama is all for doing the job, if we can kill the bad guys and get out. Last night, Obama used Bob Schieffer’s opening question about Libya to deliver part of his stump speech: “We ended the war in Iraq, refocused our attention on those who actually killed us on 9/11. And as a consequence, al-Qaida’s core leadership has been decimated.” Decimated is Obama’s code for drone strikes. But the core of this pitch is Iraq vs. Afghanistan. And the case for refocusing on Afghanistan is to get the people who killed us. Not that Afghanistan is turning out any better than Iraq, mind you. It’s not about curing the world. It’s about payback. Like George W. Bush crowing about Saddam Hussein, Obama couldn’t stop waving the scalp of Libyan dictator Muammar Qaddafi. “Got rid of a despot who had killed Americans,” Obama bragged. He added: “When it came time to making sure that Qaddafi did not stay in power, that he was captured, governor, your suggestion was that this was mission creep, that this was mission muddle. Imagine if we had pulled out at that point. You know, Muammar Qaddafi had more American blood on his hands than any individual other than Osama Bin Laden. And so we were going to make sure that we finished the job.” To Obama, finish the job doesn’t mean making Libya a paradise or even a democracy. It means terminating the villain. When you were a candidate in 2008, as I was—and I said if I got Bin Laden in our sights, I would take that shot—you said we shouldn’t move heaven and earth to get one man. And you said we should ask Pakistan for permission. And if we had asked Pakistan permission, we would not have gotten him. And it was worth moving heaven and earth to get him. You know, after we killed Bin Laden, I was at Ground Zero for a memorial and talked to a young woman who was four years old when 9/11 happened. And the last conversation she had with her father was him calling from the twin towers, saying, “Payton, I love you, and I will always watch over you.” And for the next decade, she was haunted by that conversation. And she said to me, “You know, by finally getting Bin Laden, that brought some closure to me.” And when we do things like that—when we bring those who have harmed us to justice, that sends a message to the world, and it tells Payton that we did not forget her father. If you’ve ever seen a capital murder trial, you’ll recognize the genre to which this canned, gut-wrenching story belongs. Victim, bereft child, memory, justice, closure. It’s the speech a prosecutor delivers to get a death sentence from a jury. CNN’s dial group of undecided Florida voters loved this speech. The men trailed off, but the women stayed enthralled to the end. The men gave Obama a bigger bump for his next answer. The question posed by Schieffer was what to do if the Afghan government is still unable to manage its security by the time our troops are supposed to leave. Again, Obama didn’t answer. Instead, he took this opportunity to argue that by the time he took office, “We’d forgotten why we had gone. We went because there were people who were responsible for 3,000 American deaths. And so we decimated al-Qaida’s core leadership in the border regions between Afghanistan and Pakistan.” On the TV screen, the green line showing the emotional response of men in the dial group soared. Again and again, it was Obama who spoke of righteousness, justice, and bringing the pain. He vowed to send China a “clear signal that America is a Pacific power.” The men in the dial group surged with approval as Obama recalled going to Israel’s Holocaust museum to face “the nature of evil.” He even won the contest over which candidate could pledge more often to impose “crippling” sanctions on Iran. It was a tight race, but Obama pulled it out, 4-to-3. No wonder the president capped the debate with a joke about horses and bayonets. Bayonets are for hand-to-hand combat. They’re for getting bogged down in a situation of prolonged peril. Obama has no interest in that. He’s a man of drones, not bayonets. He’s for using modern technology to administer, at minimal risk, the ancient rite of punishment. And, God help us, we love it.